Fresh off Gerald’s Game comes Mike Flanagan’s The Haunting of Hill House, a Netflix adaptation of the 1959 Shirley Jackson novel which also served as the source for 1963’s The Haunting. I have not read the book — note to self to do so — but the movie is a favorite of mine. Written by Nelson Gidding, and directed by Bob Wise, The Haunting’s scares came from what it didn’t show. No ghosts, no villains, no decapitations — for being a haunted house movie, there weren’t many apparent hauntings. Instead, the film depended on sounds, surreal visuals, and so on and so forth. Go watch it, it’s a classic. Flanagan’s version of The Haunting of Hill House is, understandably, very different. Running ten episodes, the series is set in present time, with flashbacks back to when the Crain family lived in the Hill House. The most significant difference from the original movie1 is that this, at its core, is an outright ghost story. What exactly was going on in The Haunting was up for interpretation, but the show makes no bones about it: the hauntings are to be seen. When we join the present, things are starting to go ugly very fast, as the titular haunting is starting up again. Hill House is one hell of a well-made show, and easily my favorite since Twin Peaks: The Return. Flanagan directed all ten episodes2, and the package feels more like a ten-hour movie than an episodic drama. Stories from past and present are seamlessly edited together, and often times, previously seen scenes are expanded on in later episodes. The slow reveal of the story is as labyrinth-like as the house itself, and a second viewing would be worthwhile. It is scary, too. There is a good mix of The Haunting’s silent creepiness, and more modern jump scares. (I usually can give the latter a pass, but Flanagan uses them to great effect.) The slower build is still what gets under your skin — a revelation about the Crooked Neck Lady halfway through is downright disturbing. There is no lack of dark turns in Hill House. 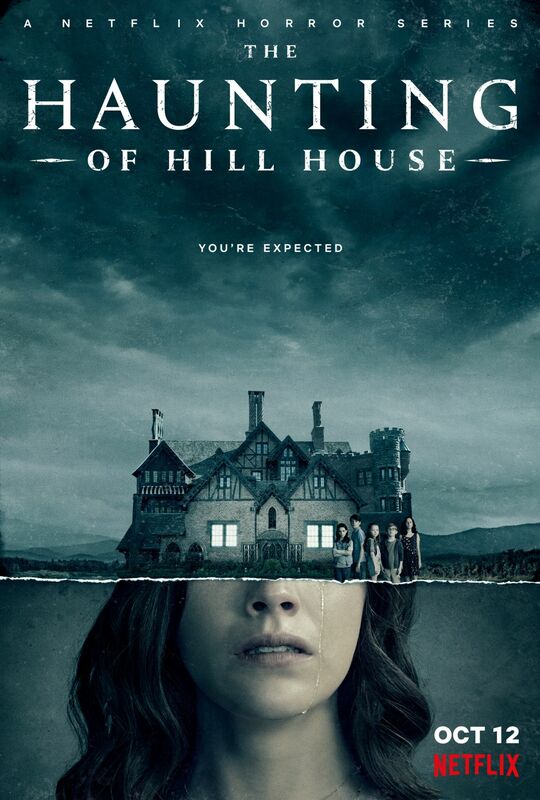 Should I describe Hill House in one phrase, it would be a modern, Gothic family horror-drama. You don’t have to be into traditional horror movies to enjoy the series, and the complex family dynamics elevates Hill House to something more than just a fright-fest. The acting throughout is spot-on. But, of course, it helps if you like being scared because let it be abundantly clear: you one-hundred-percent will be. N.B. : Maybe it’s not fair of us to claim all credit for Flanagan’s recent success after our semi-enthusiastic Hush and Oculus write-ups, but we’ll still take half of it. 1 … and maybe the book is different, but I’m fairly sure I’ve heard it’s not. 2 He also wrote three and co-wrote one.